Huckleberry Row is partnering with several other artisans, makers and vendors to provide one MASSIVE prize for you. 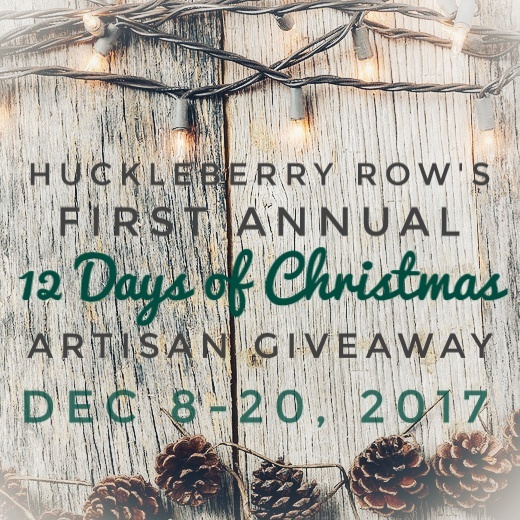 On December 7, we will be announcing how you can enter to win an AMAZING gift package in Huckleberry Row's first annual 12 Days of Christmas Artisan Giveaway. This fabulous prize is an amazing compilation from carefully selected artisans, makers and vendors. Twelve artisans, each donating an amazing item with one winner. It could be you! Receive contest updates by sharing this post, and following Huckleberry Row on Facebook, Twitter and Instagram. The more you share, the more chances you'll have to win. How to win: Entries can be collected by following, sharing, liking and commenting, as directed, throughout the contest period. Multiple daily entries available. The person with the most entries when the contest ends wins EVERYTHING! The entire prize package will be yours to keep, share, gift to others, your choice! Link to enter will be published here and available 12/08/2017 through 12/20/2017. If you are an artisan, maker or vendor who would like to participate by donating an item for this giveaway, please comment on this post. We'd love to include you and send you the complete details.